Home hotel Hotels and Resorts Promos Promos and Raffles Win an Apple iPad 2 from GoHotels.ph! 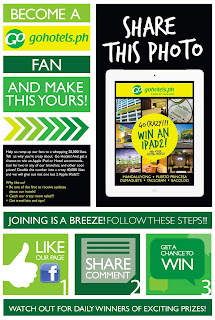 Win an Apple iPad 2 from GoHotels.ph! Are you a fan of GoHotels.ph? If not yet then this is your time to be their fan on facebook and also register on their website. GoHotels is giving away a brand new Apple iPad 2 and other cool and crazy prizes to their fans on Facebook and you can be one of them. Hurry because the promo is just extended until November 28. 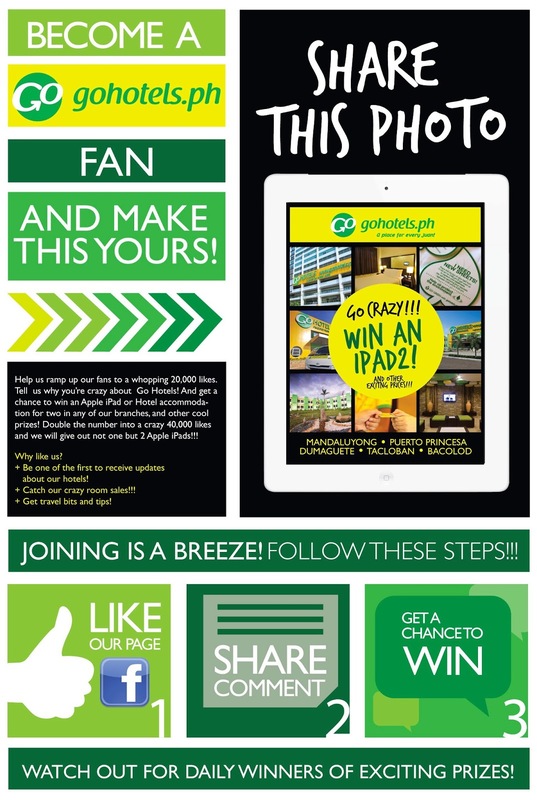 To win an Apple iPad 2 a GoHotels.ph fan must SHARE gohotels.ph post together with his/her COMMENT OR ANSWER TO THE QUESTION: What do you love about go hotels?/why are you crazy about gohotels.ph? So what are you waiting for check out GOHOTELS on Facebook now!